Pastrami is simply smoked corned beef. If you buy corned beef, it's incredibly easy to make your own pastrami. Of course, you can also make homemade corned beef from scratch if you have three weeks to let it cure. The seasoning for corned beef can be as simple as black pepper and ground coriander. However, while you are at it, try adding some extra flavor to the pastrami. Once you start making your own pastrami, you can modify the method to your liking. Use a mild wood for smoke. Anything too strong will overpower the pastrami flavor. Fruit woods like apple or cherry or other mild woods like maple or oak work well. Use a corned beef that is of consistent thickness and square in shape. This will give an even smoke across the corned beef and produce good pastrami. If there are any loose pieces, it is best to cut those off now. Also, inspect the corned beef for excess fat and a membrane layer. These should also be removed. Do not remove all the fat, but you don't need thick layers of fat on the pastrami. Once your corned beef is prepared, it is time to soak it. Corned beef is made by curing large beef cuts in a salt water brine for a couple of weeks. This salted beef is too salty to eat, so you will need to soak it for several hours to draw out most of that salt before you smoke it. This is particularly important when making pastrami because the meat will shrink as it smokes, intensifying the salt flavor. Soak your corned beef for at least 2 hours per pound, changing the water every 2 hours. This will remove most of the salt from the corned beef, but leave enough behind to flavor the pastrami effectively. Pastrami has a unique flavor and there are many variations to the spice rub that goes on it. At the heart of most of these seasonings are black pepper and ground coriander. These are the main spices that will give your pastrami that unique flavor. The rub should be applied in a thick coating. This will create a crust on the surface of the pastrami. If you want a simple pastrami rub, grind together 4 tablespoons of black peppercorns and 4 tablespoons of coriander seeds. Traditionally, pastrami is cold smoked. This means that it is smoked at cold temperatures around 60 F. This technique calls for hot smoking the pastrami, but at a fairly low temperature, around 225 F. You will need to smoke the pastrami for about 1 hour per pound. You do not need to worry about drying out the pastrami; it is dry meat anyway. The object is to cook down the meat and put some smoky flavor into it. For wood, you want to use something mild. 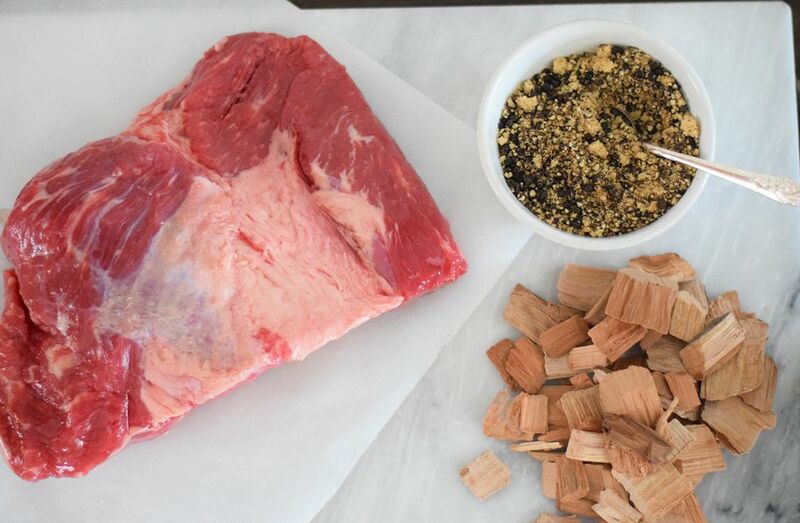 While the smoke flavor is going to add to the quality of the pastrami, you do not want to overpower the flavor with a strong wood like hickory or mesquite. A popular wood to use when making pastrami is maple. We also like to use woods like apple, cherry, or grape. Use a heavy dose of smoke at the beginning to bathe the corned beef so it can soak in the smoke flavor. 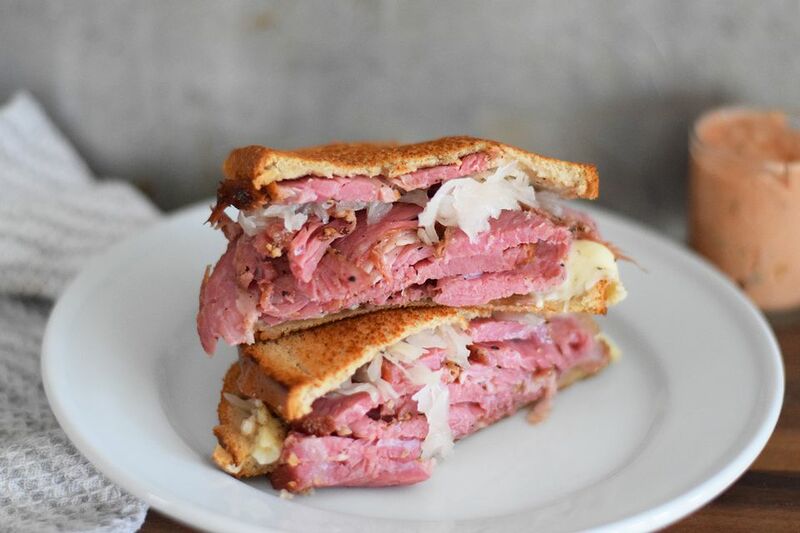 Your pastrami is done when the internal temperature of the corned beef reaches 165 F. The outside of the meat should be nearly black and the corned beef should have shrunk down by 10 to 20 percent. Since corned beef is a cured meat, it doesn't have to be cooked to a specific temperature, but by the time the meat reaches 165 F, the corned beef will have absorbed all the smoke it needs and the flavor will be set. Once the pastrami is done, it's time to start slicing. If you don't have a meat slicer, then you will have to do this with a sharp knife. Your best bet is to let the pastrami cool by placing it in the refrigerator for several hours. Once the meat is cold, it can be easily sliced. The key to good pastrami is very thin slices. To reheat the pastrami, it's best to steam it. This makes the thin pastrami slices moist and tender. You can do this in a steamer or wrap pastrami slices in wet paper towels and place it in the microwave. Pastrami will not last forever. If you are not going to eat all of it in a week, then freeze the remaining lot. It is best to carve all the pastrami first and freeze it in small packets, so you use it as needed. As with everything you smoke, make sure write down what you did including what rubs or woods were used. Then try the pastrami to see how you like it. Too peppery? Not enough smoke? These are all factors you can adjust next time.